This week’s episode of the CBS sitcom ‘How I Met Your Mother‘ took an unexpectedly Canadian turn, as Barney (Neil Patrick Harris) travelled to Vancouver to look into his fiancé Robin’s (Cobie Smulders) admission that she once was a stalker. After flying to Vancouver, Barney interrogates Robin’s exes at a local Tim Horton’s, bribing them with donuts for more information. One of the exes lets him know that the Robin’s story was featured on an episode of MuchMusic’s Underneath the Tunes. Once back in New York, Barney gathers the gang to watch the episode. It turns out Robin was once a Canadian pop star who revealed her darker side ‘Robin Daggers’ during a Gray Cup half-time show in Hamilton. In the episode, Canadians Geddy Lee, Steven Page, Luc Robitaille, Paul Shaeffer, k.d. lang and Jason Priestley could recall which Tim Horton’s they were sitting in, and what donut they were eating when the shocking event took place. While most of the Canadians’ donut choices were more traditional; blueberry fritter, maple crunch, sour dough plain. But it was Priestley’s admission of stuffing a TimBit into a Strawberry Vanilla that captured the imagination of people at Tim Horton’s headquarters. On Tuesday night, a post on Tim Horton’s Twitter account announced, “. @Jason_Priestley, we loved the idea of ‘The Priestley’ so much, we made a batch. 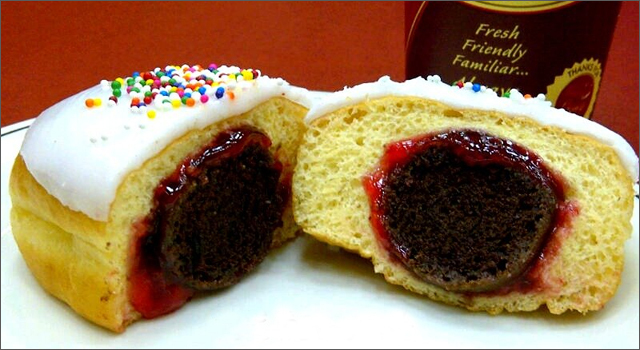 A Timbit IN a donut? Genius.“, including a photo of the creation. For those folks in other areas of the world who may not be familiar with the Canadian coffee shop and restaurant chain, Tim Hortons is an institution with 4,071 locations, 3,326 in Canada and 734 in the United States. Each day, millions of Canadians from coast-to-coast line up at the counters and drive-thrus to order the traditional double-double, box of Timbits or one of the other dozens of items on the menu. 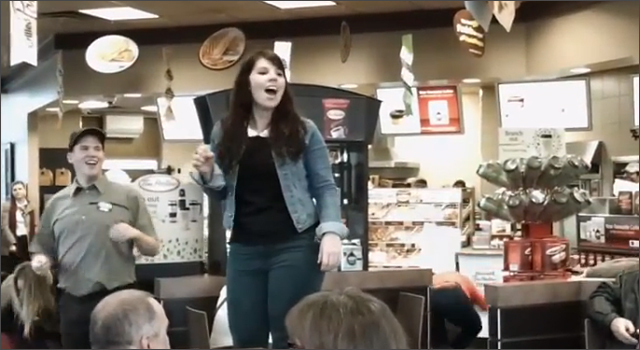 To celebrate reaching 2 million Facebook fans, the largest Canadian fan base of any brand page on Facebook, Tim Hortons staged a flash mob on November 12, thanking their employees and fans. The group performed ‘Thank You for Being a Friend’, a song written and originally performed by Andrew Gold in 1978. Of course, the song became much more famous in the 80s as the theme from The Golden Girls. After watching the video, I could really use a honey cruller.